ATLANTA, December 19, 2018	(Newswire.com) - Finding insanely cool gifts for millennials may be nearly impossible unless you consult with someone who is an internationally recognized social media expert and the host of a show called, "WHAT’S TRENDING!" 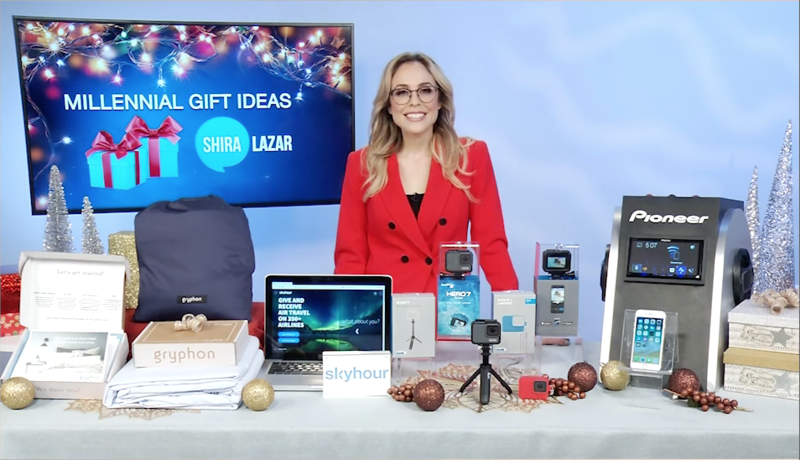 Shira Lazar produces and hosts her weekly interactive show, shared some timely gift ideas for the impossible-to-buy-for millennials. Just in time for the holidays, Shira provides some timely direction for anyone challenged with finding great gifts for millennials. Learn her strategies for finding those chic new gifts that has an entire generation talking. What is trending for millennials has always been tech and music. Don’t break up with a car, upgrade it! Pioneer Electronics in-dash NEX receiver is the perfect gift to keep people seamlessly and wirelessly connected and entertained while on the road. Each model features built-in Wi-Fi wireless connectivity that allows people to enjoy the benefits of Apple CarPlay and Android Auto, including making calls, listening to music, and navigating the roads all by voice, while keeping hands on the wheel and eyes on the road. Drivers with connected smart homes can also take command of their compatible smart devices from the road via the unit, garages included. Cost is $700. For more information, visit www.pioneerelectronics.com. It is all about an active lifestyle and cool videos, and that is why the GoPro HERO7 Silver is the perfect camera for the millennials who want to share their activities on social media. They can post straight to Instagram with the GoPro app or use new portrait mode for social sharing, and the photo timer to get the perfect selfie. The GoPro HERO7 Silver shoots stunning videos and photos. Best of all, the HERO7 Silver is normally $299, but they are running special holiday pricing through Christmas for $229, a savings of $70! Waterproof up to 33 feet, the GoPro HERO7 camera has built-in amazing video stabilization for bumpy adventures, like mountain biking, skateboarding, skiing, or even just running around with friends, making videos look super smooth. It even uses voice commands like, “GoPro take a photo” or “GoPro start recording” in 14 different languages and dialects. It also has an awesome 2-inch touch-screen, so it is possible to see what is being recorded and control the camera. Plus, every HERO7 has WiFi built in, so connecting the HERO7 to the free GoPro app to instantly accesses photos and videos and share them with friends and family or on Facebook, Instagram, etc. For more information, visit gopro.com. The perfect gift idea for the millennial looking for style is Gryphon, a brand new direct-to-consumer creator of stylish and comfortable sheets, shams, and duvets designed for happier sleep. Gryphon brings comfort and style to life through the lens of bringing a little bit more happiness into the homes and lives of consumers, one bed at a time. Gryphon is encouraging everyone to "make your bed and #makeyourhappy". They offer five cool-tone colors in three signature collections that can be ordered and tested out with their great try-at-home kit! It is a perfect gift for someone that is moving into their first place, or really anyone as a gift. For more information, visit www.gryphonhome.com. Everyone loves to travel, so it always makes for a perfect gift. Skyhour is the first of its kind air travel platform that lets you give and receive flight hours, set travel goals, and fly anywhere on over 350+ airlines this holiday season and beyond. It is so easy, users can buy or gift real time in the sky at a fixed rate per hour. Flights are booked directly through the app or website with no hidden fees and no blackout dates. Also, set and share travel goals and fund travel dreams with the help of family and friends. To gift, all that is needed is an email address and a US credit or debit card. It really is a smart and inspiring way to give and receive time in the sky this holiday season, or any time throughout the year. For more information, visit skyhour.com.